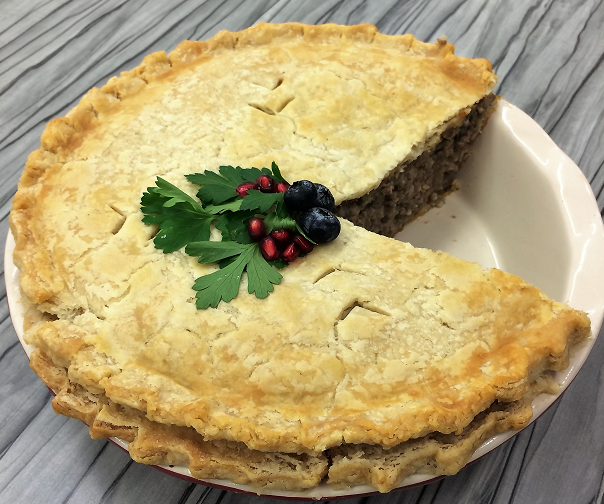 This dish is called “tourtiere” because it was originally made with tourtes or passenger pigeons. Since the disappearance of passenger pigeons, the recipe uses various meats. Traditionally, it is served on Christmas Eve. Put the first nine ingredients in a large, heavy saucepan. Cook over low heat, stirring until the meat is no longer pink and you have about half of the liquid left. Cover and cook gently for another 30-40 minutes. Mix the mashed potatoes into the cooked mixture. Let cool. Roll out the pastry into two circles. Line the pan with one circle. Fill with cool meat mixture. Place the other circle on top of the mixture. Seal edges and slash top of crust. Bake for 10 minutes at 450 degrees F, and then reduce heat to 350 degrees F and bake 30-40 minutes longer. Variation: Can add boiled chicken in the mixture, or a mixture of various ground meats, but pork is usually part of the mixture.